We are interested in the interaction between tumours and the host immune system, with a particular focus on those with a very high mutational load as a result of polymerase proofreading domain mutations. We have recently shown that ultramutated POLE-mutant colorectal and endometrial cancers have an excellent prognosis, plausibly because they elicit a strong anti-tumour T cell response against the many neoantigens they generate. Further study of these and other highly mutated cancers may provide novel insights into mutation as a cancer biomarker and therapeutic target. The chemokine CXCL13 mediates recruitment of B cells to tumors and is essential for the formation of tertiary lymphoid structures (TLSs). TLSs are thought to support antitumor immunity and are associated with improved prognosis. However, it remains unknown whether TLSs are formed in response to the general inflammatory character of the tumor microenvironment, or rather, are induced by (neo)antigen-specific adaptive immunity. We here report on the finding that the transforming growth factor beta (TGFβ)-dependent CD103+CD8+ tumor-infiltrating T-cell (TIL) subpopulation expressed and produced CXCL13. Accordingly, CD8+ T cells from peripheral blood activated in the presence of TGFβ upregulated CD103 and secreted CXCL13. Conversely, inhibition of TGFβ receptor signaling abrogated CXCL13 production. CXCL13+CD103+CD8+ TILs correlated with B-cell recruitment, TLSs, and neoantigen burden in six cohorts of human tumors. Altogether, our findings indicated that TGFβ plays a non-canonical role in coordinating immune responses against human tumors and suggest a potential role for CXCL13+CD103+CD8+ TILs in mediating B-cell recruitment and TLS formation in human tumors. Background: Constitutional loss of function (LOF) single nucleotide polymorphisms (SNPs) in pattern recognition receptors FPR1, TLR3, and TLR4 have previously been reported to predict oxaliplatin benefit in colorectal cancer. Confirmation of this association could substantially improve patient stratification. Methods: We performed a retrospective biomarker analysis of the Short Course in Oncology Therapy (SCOT) and COIN/COIN-B trials. Participant status for LOF variants in FPR1 (rs867228), TLR3 (rs3775291), and TLR4 (rs4986790/rs4986791) was determined by genotyping array or genotype imputation. Associations between LOF variants and disease-free survival (DFS) and overall survival (OS) were analyzed by Cox regression, adjusted for confounders, using additive, dominant, and recessive genetic models. All statistical tests were two-sided. Results: Our validation study populations included 2929 and 1948 patients in the SCOT and COIN/COIN-B cohorts, respectively, of whom 2728 and 1672 patients had functional status of all three SNPs determined. We found no evidence of an association between any SNP and DFS in the SCOT cohort, or with OS in either cohort, irrespective of the type of model used. This included models for which an association was previously reported for rs867228 (recessive model, multivariable-adjusted hazard ratio [HR] for DFS in SCOT = 1.19, 95% confidence interval [CI] = 0.99 to 1.45, P = .07; HR for OS in COIN/COIN-B = 0.92, 95% CI = 0.63 to 1.34, P = .66), and rs4986790 (dominant model, multivariable-adjusted HR for DFS in SCOT = 0.86, 95% CI = 0.65 to 1.13, P = .27; HR for OS in COIN/COIN-B = 1.08, 95% CI = 0.90 to 1.31, P = .40). Conclusion: In this prespecified analysis of two large clinical trials, we found no evidence that constitutional LOF SNPs in FPR1, TLR3, or TLR4 are associated with differential benefit from oxaliplatin. Our results suggest these SNPs are unlikely to be clinically useful biomarkers. PURPOSE: The elevated levels of somatic copy-number alterations (SCNAs) in a subset of high-risk endometrial cancers are suggestive of defects in pathways governing genome integrity. We sought to assess the prevalence of homologous recombination deficiency (HRD) in endometrial cancers and its association with histopathologic and molecular characteristics. EXPERIMENTAL DESIGN: Fresh tumor tissue was prospectively collected from 36 endometrial cancers, and functional HRD was examined by the ability of replicating tumor cells to accumulate RAD51 protein at DNA double-strand breaks (RAD51 foci) induced by ionizing radiation. Genomic alterations were determined by next-generation sequencing and array comparative genomic hybridization/SNP array. The prevalence of BRCA-associated genomic scars, a surrogate marker for HRD, was determined in the The Cancer Genome Atlas (TCGA) endometrial cancer cohort. RESULTS: Most endometrial cancers included in the final analysis (n = 25) were of non-endometrioid (52%), grade 3 (60%) histology, and FIGO stage I (72%). HRD was observed in 24% (n = 6) of cases and was restricted to non-endometrioid endometrial cancers (NEEC), with 46% of NEECs being HRD compared with none of the endometrioid endometrial cancers (EEC, P = 0.014). All but 1 of the HRD cases harbored either a pathogenic BRCA1 variant or high somatic copy-number (SCN) losses of HR genes. Analysis of TCGA cases supported these results, with BRCA-associated genomic scars present in up to 48% (63/132) of NEEC versus 12% (37/312) of EEC (P < 0.001). CONCLUSIONS: HRD occurs in endometrial cancers and is largely restricted to non-endometrioid, TP53-mutant endometrial cancers. Evaluation of HRD may help select patients that could benefit from treatments targeting this defect, including platinum compounds and PARP inhibitors. Purpose: Pathogenic POLE proofreading domain mutations are found in many malignancies where they are associated with ultramutation and favorable prognosis. The extent to which this prognosis depends on their sensitivity to adjuvant treatment is unknown, as is the optimal therapy for advanced-staged or recurrent POLE-mutant cancers.Experimental Design: We examined the recurrence-free survival of women with POLE-mutant and POLE-wild-type endometrial cancers (EC) in the observation arm of the randomized PORTEC-1 endometrial cancer trial (N = 245 patients with stage I endometrial cancer for analysis). Sensitivity to radiotherapy and selected chemotherapeutics was compared between Pole-mutant mouse-derived embryonic stem (mES) cells, generated using CRISPR-Cas9 (Pole mutations D275A/E275A, and cancer-associated P286R, S297F, V411L) and isogenic wild-type cell lines.Results: In the observation arm of the PORTEC-1 trial (N = 245), women with POLE-mutant endometrial cancers (N = 16) had an improved recurrence-free survival (10-year recurrence-free survival 100% vs. 80.1% for POLE-wild-type; HR, 0.143; 95% confidence interval, 0.001-0.996; P = 0.049). Pole mutations did not increase sensitivity to radiotherapy nor to chemotherapeutics in mES cells. In contrast, Pole-mutant cells displayed significantly increased sensitivity to cytarabine and fludarabine (IC50Pole P286R-mutant vs. wild-type: 0.05 vs. 0.17 μmol/L for cytarabine, 4.62 vs. 11.1 μmol/L for fludarabine; P < 0.001 for both comparisons).Conclusions: The favorable prognosis of POLE-mutant cancers cannot be explained by increased sensitivity to currently used adjuvant treatments. These results support studies exploring minimization of adjuvant therapy for early-stage POLE-mutant cancers, including endometrial and colorectal cancers. 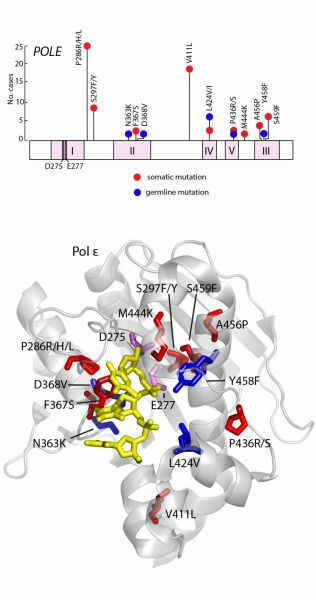 Conversely, POLE mutations result in hypersensitivity to nucleoside analogues, suggesting the use of these compounds as a potentially effective targeted treatment for advanced-stage POLE-mutant cancers. Clin Cancer Res; 24(13); 3197-203. ©2018 AACR. Genomic instability, which is a hallmark of cancer, is generally thought to occur in the middle to late stages of tumourigenesis, following the acquisition of permissive molecular aberrations such as TP53 mutation or whole genome doubling. Tumours with somatic POLE exonuclease domain mutations are notable for their extreme genomic instability (their mutation burden is among the highest in human cancer), distinct mutational signature, lymphocytic infiltrate, and excellent prognosis. To what extent these characteristics are determined by the timing of POLE mutations in oncogenesis is unknown. Here, we have shown that pathogenic POLE mutations are detectable in non-malignant precursors of endometrial and colorectal cancer. Using genome and exome sequencing, we found that multiple driver mutations in POLE-mutant cancers show the characteristic POLE mutational signature, including those in genes conventionally regarded as initiators of tumourigenesis. In POLE-mutant cancers, the proportion of monoclonal predicted neoantigens was similar to that in other cancers, but the absolute number was much greater. We also found that the prominent CD8+ T-cell infiltrate present in POLE-mutant cancers was evident in their precursor lesions. Collectively, these data indicate that somatic POLE mutations are early, quite possibly initiating, events in the endometrial and colorectal cancers in which they occur. The resulting early onset of genomic instability may account for the striking immune response and excellent prognosis of these tumours, as well as their early presentation. © 2018 The Authors. The Journal of Pathology published by John Wiley & Sons Ltd on behalf of Pathological Society of Great Britain and Ireland. BACKGROUND: Molecular indicators of colorectal cancer prognosis have been assessed in several studies, but most analyses have been restricted to a handful of markers. We aimed to identify prognostic biomarkers for colorectal cancer by sequencing panels of multiple driver genes. METHODS: In stage II or III colorectal cancers from the QUASAR 2 open-label randomised phase 3 clinical trial and an Australian community-based series, we used targeted next-generation sequencing of 82 and 113 genes, respectively, including the main colorectal cancer drivers. We investigated molecular pathways of tumorigenesis, and analysed individual driver gene mutations, combinations of mutations, or global measures such as microsatellite instability (MSI) and mutation burden (total number of non-synonymous mutations and coding indels) for associations with relapse-free survival in univariable and multivariable models, principally Cox proportional hazards models. FINDINGS: In QUASAR 2 (511 tumours), TP53, KRAS, BRAF, and GNAS mutations were independently associated with shorter relapse-free survival (p<0·035 in all cases), and total somatic mutation burden with longer survival (hazard ratio [HR] 0·81 [95% CI 0·68-0·96]; p=0·014). MSI was not independently associated with survival (HR 1·12 [95% CI 0·57-2·19]; p=0·75). We successfully validated these associations in the Australian sample set (296 tumours). In a combined analysis of both the QUASAR 2 and the Australian sample sets, mutation burden was also associated with longer survival (HR 0·84 [95% CI 0·74-0·94]; p=0·004) after exclusion of MSI-positive and POLE mutant tumours. In an extended analysis of 1732 QUASAR 2 and Australian colorectal cancers for which KRAS, BRAF, and MSI status were available, KRAS and BRAF mutations were specifically associated with poor prognosis in MSI-negative cancers. MSI-positive cancers with KRAS or BRAF mutations had better prognosis than MSI-negative cancers that were wild-type for KRAS or BRAF. Mutations in the genes NF1 and NRAS from the MAPK pathway co-occurred, and mutations in the DNA damage-response genes TP53 and ATM were mutually exclusive. We compared a prognostic model based on the gold standard of clinicopathological variables and MSI with our new model incorporating clinicopathological variables, mutation burden, and driver mutations in KRAS, BRAF, and TP53. In both QUASAR 2 and the Australian cohort, our new model was significantly better (p=0·00004 and p=0·0057, respectively, based on a likelihood ratio test). INTERPRETATION: Multigene panels identified two previously unreported prognostic associations in colorectal cancer involving TP53 mutation and total mutation burden, and confirmed associations with KRAS and BRAF. Even a modest-sized gene panel can provide important information for use in clinical practice and outperform MSI-based prognostic models. FUNDING: UK Technology Strategy Board, National Institute for Health Research Oxford Biomedical Research Centre, Cancer Australia Project, Cancer Council Victoria, Ludwig Institute for Cancer Research, Victorian Government. Next-generation sequencing (NGS) efforts have established catalogs of mutations relevant to cancer development. However, the clinical utility of this information remains largely unexplored. Here, we present the results of the first eight patients recruited into a clinical whole-genome sequencing (WGS) program in the United Kingdom. We performed PCR-free WGS of fresh frozen tumors and germline DNA at 75× and 30×, respectively, using the HiSeq2500 HTv4. Subtracted tumor VCFs and paired germlines were subjected to comprehensive analysis of coding and noncoding regions, integration of germline with somatically acquired variants, and global mutation signatures and pathway analyses. Results were classified into tiers and presented to a multidisciplinary tumor board. WGS results helped to clarify an uncertain histopathological diagnosis in one case, led to informed or supported prognosis in two cases, leading to de-escalation of therapy in one, and indicated potential treatments in all eight. Overall 26 different tier 1 potentially clinically actionable findings were identified using WGS compared with six SNVs/indels using routine targeted NGS. These initial results demonstrate the potential of WGS to inform future diagnosis, prognosis, and treatment choice in cancer and justify the systematic evaluation of the clinical utility of WGS in larger cohorts of patients with cancer. BACKGROUND: Stage 1 seminoma is frequently cured by radical orchiectomy; however, the management strategies after this diagnosis vary in terms of the use of adjuvant treatment and the nature of the follow-up protocols. We analyzed stage 1 seminomas treated in the Thames Valley Cancer Network for outcomes to determine whether any factors are predictive of recurrence. We also studied relapses to determine the optimal follow-up schedule and protocol. MATERIALS AND METHODS: Data were obtained from centers within the Thames Valley Cancer Network for a 12-year period from 2004 to 2016. We identified 501 patients with stage 1 seminoma. RESULTS: Relapses occurred in 6.2% of the patients receiving adjuvant treatment and 6.1% of those who did not. The only statistically significant predictive factor identified for relapse was rete testis invasion, and the risk was greater when only stromal rete invasion was included, rather than pagetoid as well. A trend was seen toward an increased risk with increased tumor size, but the difference was not statistically significant. Recurrences developed within the first 2 years after surgery in nearly 75% of cases and were identified through surveillance computed tomography scans in 54.8% of the patients. All relapses were treated curatively. CONCLUSION: Active surveillance leads to excellent outcomes for stage 1 seminoma; however, adjuvant treatment should be reserved for those with high-risk disease. Follow-up schedules should include computed tomography imaging during the first 3 years, long-term measurement of tumor markers, and mechanisms for patients to be seen promptly should symptoms of tumor recurrence occur. Human papilloma virus (HPV)-induced cervical cancer constitutively expresses viral E6/E7 oncoproteins and is an excellent target for T cell-based immunotherapy. However, not all tumor-infiltrating T cells confer equal benefit to patients, with epithelial T cells being superior to stromal T cells. To assess whether the epithelial T cell biomarker CD103 could specifically discriminate the beneficial antitumor T cells, association of CD103 with clinicopathological variables and outcome was analyzed in the TCGA cervical cancer data set (n = 304) and by immunohistochemistry (IHC) in an independent cohort (n = 460). Localization of CD103+ cells in the tumor was assessed by immunofluorescence. Furthermore, use of CD103 as a response biomarker was assessed in an in vivo E6/E7+ tumor model. Our results show that CD103 gene expression was strongly correlated with cytotoxic T cell markers (e.g. CD8/GZMB/PD1) in the TCGA series. In line with this, CD103+ cells in the IHC series co-expressed CD8 and were preferentially located in cervical tumor epithelium. High CD103+ cell infiltration was strongly associated with an improved prognosis in both series, and appeared to be a better predictor of outcome than CD8. Interestingly, the prognostic benefit of CD103 in both series seemed limited to patients receiving radiotherapy. In a preclinical mouse model, HPV E6/E7-targeted therapeutic vaccination in combination with radiotherapy increased the intratumoral number of CD103+ CD8+ T cells, providing a potential mechanistic basis for our results. In conclusion, CD103 is a promising marker for rapid assessment of tumor-reactive T cell infiltration of cervical cancers and a promising response biomarker for E6/E7-targeted immunotherapy. Church DN. 2017. Cancer Predisposition Syndromes: Lessons for Truly Precision Medicine	JOURNAL OF PATHOLOGY,	243	pp. S8-S8. High-risk endometrial cancer (EC) is an aggressive disease for which new therapeutic options are needed. Aims of this study were to validate the enhanced immune response in highly mutated ECs and to explore immune profiles in other EC subgroups. We evaluated immune infiltration in 116 high-risk ECs from the TransPORTEC consortium, previously classified into four molecular subtypes: (i) ultramutated POLE exonuclease domain-mutant ECs (POLE-mutant); (ii) hypermutated microsatellite unstable (MSI); (iii) p53-mutant; and (iv) no specific molecular profile (NSMP). Within The Cancer Genome Atlas (TCGA) EC cohort, significantly higher numbers of predicted neoantigens were demonstrated in POLE-mutant and MSI tumors compared with NSMP and p53-mutants. This was reflected by enhanced immune expression and infiltration in POLE-mutant and MSI tumors in both the TCGA cohort (mRNA expression) and the TransPORTEC cohort (immunohistochemistry) with high infiltration of CD8+ (90% and 69%), PD-1+ (73% and 69%) and PD-L1+ immune cells (100% and 71%). Notably, a subset of p53-mutant and NSMP cancers was characterized by signs of an antitumor immune response (43% and 31% of tumors with high infiltration of CD8+ cells, respectively), despite a low number of predicted neoantigens. In conclusion, the presence of enhanced immune infiltration, particularly high numbers of PD-1 and PD-L1 positive cells, in highly mutated, neoantigen-rich POLE-mutant and MSI endometrial tumors suggests sensitivity to immune checkpoint inhibitors. Cancer predisposition syndromes are typically uncommon, monogenic, high-penetrance disorders. Despite their rarity, they have proven to be highly clinically relevant in directing cancer prevention strategies. As such, they share notable similarities with an expanding class of low-frequency somatic mutations that are associated with a striking prognostic or predictive effect in the tumours in which they occur. In this review, we highlight these commonalities, with particular reference to mutations in the proofreading domain of replicative DNA polymerases. These molecular phenotypes may occur as either germline or somatic events, and in the latter case, have been shown to confer a favourable prognosis and potential increased benefit from immune checkpoint inhibition. We note that incorporation of these variants into clinical management algorithms will help refine patient management, and that this will be further improved by the inclusion of other germline variants, such as those that determine the likelihood of benefit or toxicity from anti-neoplastic therapy. Finally, we propose that such integrated patient and tumour profiling will be essential if we are to deliver truly precision medicine for cancer patients, but in a similar way to rare germline mutations, we must ensure that we identify and utilize rare somatic mutations with strong predictive and prognostic effects. Copyright © 2016 Pathological Society of Great Britain and Ireland. Published by John Wiley & Sons, Ltd.
Background: Mismatch repair (MMR)-deficiency analysis is increasingly recommended for all endometrial cancers, as it identifies Lynch syndrome patients, and is emerging as a prognostic classifier to guide adjuvant treatment. The aim of this study was to define the optimal approach for MMR-deficiency testing and to clarify discrepancies between microsatellite instability (MSI) analysis and immunohistochemical (IHC) analysis of MMR protein expression. Patients and methods: Six hundred ninety- six endometrial cancers were analyzed for MSI (pentaplex panel) and MMR protein expression (IHC). Agreement between methodologies was calculated using Cohen's Kappa. MLH1 promoter hypermethylation, dinucleotide microsatellite markers and somatic MMR and POLE exonuclease domain (EDM) gene variants (using next-generation/Sanger sequencing) were analyzed in discordant cases. Results: MSI was found in 180 patients. Complete loss of expression of one or more MMR proteins was observed in 196 cases. A PMS2- and MSH6-antibody panel detected all cases with loss of MMR protein expression. The results of MSI and MMR protein expression were concordant in 655/696 cases (kappa = 0.854, P < 0.001). Ambiguous cases (n = 41, 6%) included: subclonal loss of MMR protein expression (n = 18), microsatellite stable or MSI-low cases with loss of MMR protein expression (n = 20), and MSI-low or MSI-high cases with retained MMR protein expression (n = 3). Most of these cases could be explained by MLH1 promoter hypermethylation. Five of seven cases with solitary loss of PMS2 or MSH6 protein expression carried somatic gene variants. Two MSI-high cases with retained MMR protein expression carried a POLE-EDM variant. Conclusion: MSI and IHC analysis are highly concordant in endometrial cancer. This holds true for cases with subclonal loss of MMR protein expression. Discordant MMR-proficient/MSI-high cases (<1%), may be explained by POLE-EDM variants. BACKGROUND: Antiangiogenic agents have established efficacy in the treatment of metastatic colorectal cancer. We investigated whether bevacizumab could improve disease-free survival in the adjuvant setting after resection of the primary tumour. METHODS: For the open-label, randomised, controlled QUASAR 2 trial, which was done at 170 hospitals in seven countries, we recruited patients aged 18 years or older with WHO performance status scores of 0 or 1 who had undergone potentially curative surgery for histologically proven stage III or high-risk stage II colorectal cancer. Patients were randomly assigned (1:1) to receive eight 3-week cycles of oral capecitabine alone (1250 mg/m2 twice daily for 14 days followed by a break for 7 days) or the same regimen of oral capecitabine plus 16 cycles of 7·5 mg/kg bevacizumab by intravenous infusion over 90 min on day 1 of each cycle. 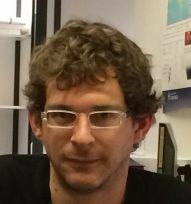 Randomisation was done by a computer-generated schedule with use of minimisation with a random element stratified by age, disease stage, tumour site, and country. The study was open label and no-one was masked to treatment assignment. The primary endpoint was 3-year disease-free survival, assessed in the intention-to-treat population. Toxic effects were assessed in patients who received at least one dose of randomised treatment. This trial is registered with the ISRCTN registry, number ISRCTN45133151. FINDINGS: Between April 25, 2005, and Oct 12, 2010, 1952 eligible patients were enrolled, of whom 1941 had assessable data (968 in the capecitabine alone group and 973 in the capecitabine and bevacizumab group). Median follow-up was 4·92 years (IQR 4·00-5·16). Disease-free survival at 3 years did not differ between the groups (75·4%, 95% CI 72·5-78·0 in the capecitabine and bevacizumab group vs 78·4%, 75·7-80·9 in the capecitabine alone group; hazard ratio 1·06, 95% CI 0·89-1·25, p=0·54). The most common grade 3-4 adverse events were hand-foot syndrome (201 [21%] of 963 in the capecitabine alone group vs 257 [27%] of 959 in the capecitabine and bevacizumab group) and diarrhoea (102 [11%] vs 104 [11%]), and, with the addition of bevacizumab, expected increases were recorded in all-grade hypertension (320 [33%] vs 75 [8%]), proteinuria (197 [21%] vs 49 [5%]), and wound healing problems (30 [3%] vs 17 [2%]). 571 serious adverse events were reported (221 with capecitabine alone and 350 with capecitabine and bevacizumab). Most of these were gastrointestinal (n=245) or cardiovascular (n=169). 23 deaths within 6 months of randomisation were classified as being related to treatment, eight in the capecitabine alone group and 15 in the capecitabine and bevacizumab group. INTERPRETATION: The addition of bevacizumab to capecitabine in the adjuvant setting for colorectal cancer yielded no benefit in the treatment of an unselected population and should not be used. FUNDING: Roche. BACKGROUND: Precision cancer medicine depends on defining distinct tumour subgroups using biomarkers that may occur at very modest frequencies. One such subgroup comprises patients with exceptionally mutated (ultramutated) cancers caused by mutations that impair DNA polymerase epsilon (POLE) proofreading. METHODS: We examined the association of POLE proofreading domain mutation with clinicopathological variables and immune response in colorectal cancers from clinical trials (VICTOR, QUASAR2, and PETACC-3) and colorectal cancer cohorts (Leiden University Medical Centre 1 and 2, Oslo 1 and 2, Bern, AMC-AJCC-II, and Epicolon-1). We subsequently investigated its association with prognosis in stage II/III colorectal cancer by Cox regression of pooled individual patient data from more than 4500 cases from these studies. FINDINGS: Pathogenic somatic POLE mutations were detected in 66 (1·0%) of 6517 colorectal cancers, and were mutually exclusive with mismatch repair deficiency (MMR-D) in the 6277 cases for whom both markers were determined (none of 66 vs 833 [13·4%] of 6211; p<0·0001). Compared with cases with wild-type POLE, cases with POLE mutations were younger at diagnosis (median 54·5 years vs 67·2 years; p<0·0001), were more frequently male (50 [75·8%] of 66 vs 3577 [55·5%] of 6445; p=0·0010), more frequently had right-sided tumour location (44 [68·8%] of 64 vs 2463 [39·8%] of 6193; p<0·0001), and were diagnosed at an earlier disease stage (p=0·006, χ2 test for trend). Compared with mismatch repair proficient (MMR-P) POLE wild-type tumours, POLE-mutant colorectal cancers displayed increased CD8+ lymphocyte infiltration and expression of cytotoxic T-cell markers and effector cytokines, similar in extent to that observed in immunogenic MMR-D cancers. Both POLE mutation and MMR-D were associated with significantly reduced risk of recurrence compared with MMR-P colorectal cancers in multivariable analysis (HR 0·34 [95% CI 0·11-0·76]; p=0·0060 and 0·72 [0·60-0·87]; p=0·00035), although the difference between the groups was not significant. INTERPRETATION: POLE proofreading domain mutations identify a subset of immunogenic colorectal cancers with excellent prognosis. This association underscores the importance of rare biomarkers in precision cancer medicine, but also raises important questions about how to identify and implement them in practice. FUNDING: Cancer Research UK, Academy of Medical Sciences, Health Foundation, EU, ERC, NIHR, Wellcome Trust, Dutch Cancer Society, Dutch Digestive Foundation. PURPOSE: Testicular cancers are an uncommon and highly curable group of tumors that are typically managed by specialist multidisciplinary teams (MDTs). Although recent guidelines have emphasized the importance of tumor prognostic factors in predicting recurrence and personalizing therapy in early-stage disease, the role of central pathology review in determining these factors is unclear. PATIENTS AND METHODS: We compared the referral histopathology reports with those obtained after expert central review for all cases reviewed by the UK Thames Valley Cancer Network testicular tumor MDT from August 2004 to September 2012. For cases in which the findings differed, we recorded the effect of the alteration on the estimates of patient prognosis and predicted clinical management using international (European Society of Medical Oncology [ESMO]) and local guidelines. RESULTS: The histopathology reports were altered after central review in 129 of 465 cases (27.7%) referred to the testicular tumor MDT during the study period. These resulted in changes in the estimation of prognosis for 42 patients (9.0% total), with a predicted affect on management according to the ESMO guidelines in 30 cases (6.5%). These proportions were broadly similar for both seminoma and nonseminoma, although the reasons for the discrepancies differed between the 2 (principally errors in categorization of rete testis invasion in seminoma and of lymphovascular invasion in nonseminoma). Changes to the tumor type were uncommon (2 cases). CONCLUSION: Central MDT review results in frequent, clinically relevant alterations to testicular tumor histopathology reports for testicular tumors. The results of our study demonstrate the importance of specialist MDTs to inform patient-centered care and ensure best practice in the management of these uncommon cancers. We conducted a meta-analysis of three endometrial cancer genome-wide association studies (GWAS) and two follow-up phases totaling 7,737 endometrial cancer cases and 37,144 controls of European ancestry. Genome-wide imputation and meta-analysis identified five new risk loci of genome-wide significance at likely regulatory regions on chromosomes 13q22.1 (rs11841589, near KLF5), 6q22.31 (rs13328298, in LOC643623 and near HEY2 and NCOA7), 8q24.21 (rs4733613, telomeric to MYC), 15q15.1 (rs937213, in EIF2AK4, near BMF) and 14q32.33 (rs2498796, in AKT1, near SIVA1). We also found a second independent 8q24.21 signal (rs17232730). Functional studies of the 13q22.1 locus showed that rs9600103 (pairwise r(2) = 0.98 with rs11841589) is located in a region of active chromatin that interacts with the KLF5 promoter region. The rs9600103[T] allele that is protective in endometrial cancer suppressed gene expression in vitro, suggesting that regulation of the expression of KLF5, a gene linked to uterine development, is implicated in tumorigenesis. These findings provide enhanced insight into the genetic and biological basis of endometrial cancer. How chemotherapy affects carcinoma genomes is largely unknown. Here we report whole-exome and deep sequencing of 30 paired oesophageal adenocarcinomas sampled before and after neo-adjuvant chemotherapy. Most, but not all, good responders pass through genetic bottlenecks, a feature associated with higher mutation burden pre-treatment. Some poor responders pass through bottlenecks, but re-grow by the time of surgical resection, suggesting a missed therapeutic opportunity. Cancers often show major changes in driver mutation presence or frequency after treatment, owing to outgrowth persistence or loss of sub-clones, copy number changes, polyclonality and/or spatial genetic heterogeneity. Post-therapy mutation spectrum shifts are also common, particularly C>A and TT>CT changes in good responders or bottleneckers. Post-treatment samples may also acquire mutations in known cancer driver genes (for example, SF3B1, TAF1 and CCND2) that are absent from the paired pre-treatment sample. Neo-adjuvant chemotherapy can rapidly and profoundly affect the oesophageal adenocarcinoma genome. Monitoring molecular changes during treatment may be clinically useful. Endometrial cancers (ECs) with POLE proofreading mutations are typified by ultramutation and excellent prognosis. We investigated whether these were related, and found that POLE-mutant ECs display a robust T cell response that corresponds to an enrichment of antigenic tumor neopeptides. Enhanced immunogenicity may explain the favorable outcome of POLE-mutant ECs. Although it has long been recognized that the exonucleolytic proofreading activity intrinsic to the replicative DNA polymerases Pol δ and Pol ε is essential for faithful replication of DNA, evidence that defective DNA polymerase proofreading contributes to human malignancy has been limited. 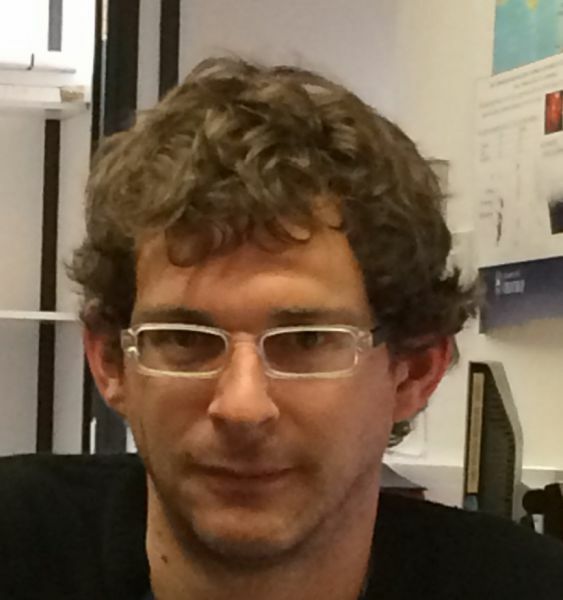 However, recent studies have shown that germline mutations in the proofreading domains of Pol δ and Pol ε predispose to cancer, and that somatic Pol ε proofreading domain mutations occur in multiple sporadic tumours, where they underlie a phenotype of 'ultramutation' and favourable prognosis. 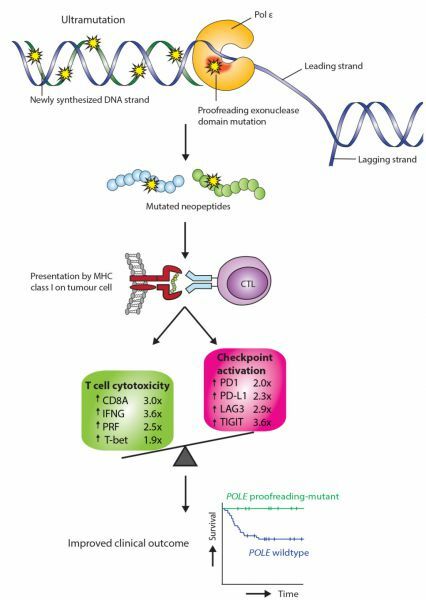 In this Review, we summarize the current understanding of the mechanisms and consequences of polymerase proofreading domain mutations in human malignancies, and highlight the potential utility of these variants as novel cancer biomarkers and therapeutic targets. Studies in early-stage, predominantly low- and intermediate-risk endometrial cancer have demonstrated that L1 cell adhesion molecule (L1CAM) overexpression identifies patients at increased risk of recurrence, yet its prognostic significance in high-risk endometrial cancer is unclear. To evaluate this, its frequency, and the relationship of L1CAM with the established endometrial cancer biomarker p53, we analyzed the expression of both markers by immunohistochemistry in a pilot series of 116 endometrial cancers (86 endometrioid, 30 non-endometrioid subtype) with high-risk features (such as high tumor grade and deep myometrial invasion) and correlated results with clinical outcome. We used The Cancer Genome Atlas (TCGA) endometrial cancer series to validate our findings. Using the previously reported cutoff of 10% positive staining, 51/116 (44%) tumors were classified as L1CAM-positive, with no significant association between L1CAM positivity and the rate of distant metastasis (P=0.195). However, increasing the threshold for L1CAM positivity to 50% resulted in a reduction of the frequency of L1CAM-positive tumors to 24% (28/116), and a significant association with the rate of distant metastasis (P=0.018). L1CAM expression was strongly associated with mutant p53 in the high-risk and TCGA series (P<0.001), although a substantial fraction (36% of endometrioid, 10% of non-endometrioid morphology) of p53-mutant endometrial cancers displayed <10% L1CAM positivity. Moreover, 30% of p53-wild-type non-endometrioid endometrial cancers demonstrated diffuse L1CAM staining, suggesting p53-independent mechanisms of L1CAM overexpression. In conclusion, the previously proposed threshold for L1CAM positivity of >10% does not predict prognosis in high-risk endometrial cancer, whereas an alternative threshold (>50%) does. L1CAM expression is strongly, but not universally, associated with mutant p53, and may be strong enough for clinical implementation as prognostic marker in combination with p53. The high frequency of L1CAM expression in high-risk endometrial cancers suggests that it may also be a promising therapeutic target in this tumor subset. PURPOSE: Despite substantial morbidity and mortality of influenza and pneumococcal infections in cancer patients treated with chemotherapy, vaccination against both illnesses is infrequent. We evaluated the impact of implementation of clinical guidelines on vaccination of chemotherapy patients treated in our institute. METHODS: We performed a prospective audit before (2012) and after (2013-2014) the introduction of immunisation guidelines for chemotherapy patients in a UK tertiary cancer centre. RESULTS: Guideline implementation was associated with a significant increase in the rate of pneumococcal vaccination compared to the 2012 baseline (47 vs. 25 %, P = 0.0018), though this was not sustained the following year (34 %, P = 0.13, vs. baseline). Influenza vaccine coverage was high (∼ 70 %) throughout. There was a marked disparity between patients aged ≤ 65 and those >65 years in the rate of pneumococcal vaccination in both 2013 and 2014 (38 vs. 68 % and 17 vs. 53 %, respectively, both P < 0.001), and, to a lesser extent, in the rate of influenza vaccination in the same period (64 vs. 82 %, P < 0.1, and 63 vs. 85 %, P = 0.009, respectively). CONCLUSIONS: The implementation of clinical vaccine guidelines was associated with a significant increase in pneumococcal vaccination, though continued effort appears required to deliver persistent improvement. Initiatives to increase vaccination uptake in patients aged ≤ 65 are merited. Van Gool IC, Stelloo E, Nout RA, Nijman HW, Edmondson RJ, Church DN, MacKay HJ, Leary A, Powell ME, Mileshkin L, Creutzberg CL, Smit V, Bosse T et al. 2015. PROGNOSTIC VALUE OF L1CAM EXPRESSION AND ITS ASSOCIATION WITH MUTANT P53 EXPRESSION IN HIGH-RISK ENDOMETRIAL CANCER PATIENTS: A TRANSPORTEC STUDY	INTERNATIONAL JOURNAL OF GYNECOLOGICAL CANCER,	25	(9),	pp. 258-259. Lynch syndrome (LS) accounts for around 3% of colorectal cancers (CRCs) and is caused by germline mutations in mismatch repair (MMR) genes. Recently, screening strategies to identify patients with LS have become popular. We audited CRCs screened with MMR immunohistochemistry (IHC) in 2013. 209 tumours had MMR IHC performed at a cost of £12 540. 47/209 (21%) cases showed IHC loss of expression in at least one MMR protein. 28/44 cases with loss of MLH1 had additional BRAF V600E testing, at a cost of £5040. MMR IHC reduced the number of potential clinical genetics referrals from 209 to 47. BRAF mutation testing, performed in a subset of cases with MLH1 loss, further reduced this to 21. At a cost of £1340 per referral, this model of LS screening for clinical genetics referral had significant potential savings (£234 340) and can be easily implemented in parallel with MMR IHC done for prognostication in CRCs. PURPOSE: Recent studies have shown that 7% to 12% of endometrial cancers are ultramutated due to somatic mutation in the proofreading exonuclease domain of the DNA replicase POLE. Interestingly, these tumors have an excellent prognosis. In view of the emerging data linking mutation burden, immune response, and clinical outcome in cancer, we investigated whether POLE-mutant endometrial cancers showed evidence of increased immunogenicity. EXPERIMENTAL DESIGN: We examined immune infiltration and activation according to tumor POLE proofreading mutation in a molecularly defined endometrial cancer cohort including 47 POLE-mutant tumors. We sought to confirm our results by analysis of RNAseq data from the TCGA endometrial cancer series and used the same series to examine whether differences in immune infiltration could be explained by an enrichment of immunogenic neoepitopes in POLE-mutant endometrial cancers. RESULTS: Compared with other endometrial cancers, POLE mutants displayed an enhanced cytotoxic T-cell response, evidenced by increased numbers of CD8(+) tumor-infiltrating lymphocytes and CD8A expression, enrichment for a tumor-infiltrating T-cell gene signature, and strong upregulation of the T-cell cytotoxic differentiation and effector markers T-bet, Eomes, IFNG, PRF, and granzyme B. This was accompanied by upregulation of T-cell exhaustion markers, consistent with chronic antigen exposure. In silico analysis confirmed that POLE-mutant cancers are predicted to display more antigenic neoepitopes than other endometrial cancers, providing a potential explanation for our findings. CONCLUSIONS: Ultramutated POLE proofreading-mutant endometrial cancers are characterized by a robust intratumoral T-cell response, which correlates with, and may be caused by an enrichment of antigenic neopeptides. Our study provides a plausible mechanism for the excellent prognosis of these cancers. This study aimed to investigate whether molecular analysis can be used to refine risk assessment, direct adjuvant therapy, and identify actionable alterations in high-risk endometrial cancer. TransPORTEC, an international consortium related to the PORTEC3 trial, was established for translational research in high-risk endometrial cancer. In this explorative study, routine molecular analyses were used to detect prognostic subgroups: p53 immunohistochemistry, microsatellite instability and POLE proofreading mutation. Furthermore, DNA was analyzed for hotspot mutations in 13 additional genes (BRAF, CDKNA2, CTNNB1, FBXW7, FGFR2, FGFR3, FOXL2, HRAS, KRAS, NRAS, PIK3CA, PPP2R1A, and PTEN) and protein expression of ER, PR, PTEN, and ARID1a was analyzed. Rates of distant metastasis, recurrence-free, and overall survival were calculated using the Kaplan-Meier method and log-rank test. In total, samples of 116 high-risk endometrial cancer patients were included: 86 endometrioid; 12 serous; and 18 clear cell. For endometrioid, serous, and clear cell cancers, 5-year recurrence-free survival rates were 68%, 27%, and 50% (P=0.014) and distant metastasis rates 23%, 64%, and 50% (P=0.001), respectively. Four prognostic subgroups were identified: (1) a group of p53-mutant tumors; (2) microsatellite instable tumors; (3) POLE proofreading-mutant tumors; and (4) a group with no specific molecular profile (NSMP). In group 3 (POLE-mutant; n=14) and group 2 (microsatellite instable; n=19) patients, no distant metastasis occurred, compared with 50% distant metastasis rate in group 1 (p53-mutant; n=36) and 39% in group 4 (NSMP; P<0.001). Five-year recurrence-free survival was 93% and 95% for group 3 (POLE-mutant) and group 2 (microsatellite instable) vs 42% (group 1, p53-mutant) and 52% (group 4, NSMP; P<0.001). Targetable FBXW7 and FGFR2 mutations (6%), alterations in the PI3K-AKT pathway (60%) and hormone receptor positivity (45%) were frequently found. In conclusion, molecular analysis of high-risk endometrial cancer identifies four distinct prognostic subgroups, with potential therapeutic implications. High frequencies of targetable alterations were identified and may serve as targets for individualized treatment. BACKGROUND: Current risk stratification in endometrial cancer (EC) results in frequent over- and underuse of adjuvant therapy, and may be improved by novel biomarkers. We examined whether POLE proofreading mutations, recently reported in about 7% of ECs, predict prognosis. METHODS: We performed targeted POLE sequencing in ECs from the PORTEC-1 and -2 trials (n = 788), and analyzed clinical outcome according to POLE status. We combined these results with those from three additional series (n = 628) by meta-analysis to generate multivariable-adjusted, pooled hazard ratios (HRs) for recurrence-free survival (RFS) and cancer-specific survival (CSS) of POLE-mutant ECs. All statistical tests were two-sided. RESULTS: POLE mutations were detected in 48 of 788 (6.1%) ECs from PORTEC-1 and-2 and were associated with high tumor grade (P < .001). Women with POLE-mutant ECs had fewer recurrences (6.2% vs 14.1%) and EC deaths (2.3% vs 9.7%), though, in the total PORTEC cohort, differences in RFS and CSS were not statistically significant (multivariable-adjusted HR = 0.43, 95% CI = 0.13 to 1.37, P = .15; HR = 0.19, 95% CI = 0.03 to 1.44, P = .11 respectively). However, of 109 grade 3 tumors, 0 of 15 POLE-mutant ECs recurred, compared with 29 of 94 (30.9%) POLE wild-type cancers; reflected in statistically significantly greater RFS (multivariable-adjusted HR = 0.11, 95% CI = 0.001 to 0.84, P = .03). In the additional series, there were no EC-related events in any of 33 POLE-mutant ECs, resulting in a multivariable-adjusted, pooled HR of 0.33 for RFS (95% CI = 0.12 to 0.91, P = .03) and 0.26 for CSS (95% CI = 0.06 to 1.08, P = .06). CONCLUSION: POLE proofreading mutations predict favorable EC prognosis, independently of other clinicopathological variables, with the greatest effect seen in high-grade tumors. This novel biomarker may help to reduce overtreatment in EC. © 2014, Springer Science+Business Media New York. Despite adjuvant chemotherapy, between 20 and 50 % of patients with stage II/III colorectal cancer (CRC) will suffer recurrence, usually as incurable metastatic disease. Attempts to improve the efficacy of adjuvant regimens with addition of biologics have failed, and there is therefore a pressing need for novel therapeutic approaches. Inflammatory mediators, including the cyclooxygenase (COX) enzyme family, are commonly upregulated in CRC and known to promote tumour growth in preclinical models. COX inhibition by aspirin and other non-steroidal anti-inflammatory drugs (NSAIDs) may exert an antineoplastic effect. Despite considerable evidence in CRC prevention and emerging data demonstrating that regular aspirin reduces the frequency of metastases following CRC resection, its use has not become widespread due to concerns regarding toxicities. However, the recent identification of biomarkers that may predict aspirin benefit has renewed interest in the field. Large, randomised controlled trials underway/in set-up should provide definitive evidence of the efficacy of aspirin/NSAIDs as adjuvant therapy in CRC. This review examines the field to date, with focus on the biomarkers which may help refine the risk-benefit ratio. If we were to summarize the rationale that underpins medical oncology in a Latin aphorism, it might be 'veneno ergo sum'; that is, I poison, therefore I am. The burden of chemotherapy-associated toxicity is well recognized, but we have relatively few tools that increase the precision of anticancer drug prescribing. We propose a shift in emphasis from the focussed study of polymorphisms in drug metabolic pathways in small sets of patients to broader agnostic analyses to systematically correlate germline genetic variants with adverse events in large, well-defined cancer populations. Thus, we propose the new science of 'toxgnostics' (that is, the systematic, agnostic study of genetic predictors of toxicity from anticancer therapy). © 2014 Macmillan Publishers Limited. If we were to summarize the rationale that underpins medical oncology in a Latin aphorism, it might be 'veneno ergo sum'; that is, I poison, therefore I am. The burden of chemotherapy-associated toxicity is well recognized, but we have relatively few tools that increase the precision of anticancer drug prescribing. We propose a shift in emphasis from the focussed study of polymorphisms in drug metabolic pathways in small sets of patients to broader agnostic analyses to systematically correlate germline genetic variants with adverse events in large, well-defined cancer populations. Thus, we propose the new science of 'toxgnostics' (that is, the systematic, agnostic study of genetic predictors of toxicity from anticancer therapy). PURPOSE: Fluourouracil (FU) is a mainstay of chemotherapy, although toxicities are common. Genetic biomarkers have been used to predict these adverse events, but their utility is uncertain. PATIENTS AND METHODS: We tested candidate polymorphisms identified from a systematic literature search for associations with capecitabine toxicity in 927 patients with colorectal cancer in the Quick and Simple and Reliable trial (QUASAR2). We then performed meta-analysis of QUASAR2 and 16 published studies (n = 4,855 patients) to examine the polymorphisms in various FU monotherapy and combination therapy regimens. RESULTS: Global capecitabine toxicity (grades 0/1/2 v grades 3/4/5) was associated with the rare, functional DPYD alleles 2846T>A and *2A (combined odds ratio, 5.51; P = .0013) and with the common TYMS polymorphisms 5'VNTR2R/3R and 3'UTR 6bp ins-del (combined odds ratio, 1.31; P = 9.4 × 10(-6)). There was weaker evidence that these polymorphisms predict toxicity from bolus and infusional FU monotherapy. No good evidence of association with toxicity was found for the remaining polymorphisms, including several currently included in predictive kits. No polymorphisms were associated with toxicity in combination regimens. CONCLUSION: A panel of genetic biomarkers for capecitabine monotherapy toxicity would currently comprise only the four DPYD and TYMS variants above. We estimate this test could provide 26% sensitivity, 86% specificity, and 49% positive predictive value-better than most available commercial kits, but suboptimal for clinical use. The test panel might be extended to include additional, rare DPYD variants functionally equivalent to *2A and 2846A, though insufficient evidence supports its use in bolus, infusional, or combination FU. There remains a need to identify further markers of FU toxicity for all regimens. PURPOSE: Aspirin and other nonsteroidal anti-inflammatory drugs (NSAIDs) protect against colorectal cancer (CRC) and are associated with reduced disease recurrence and improved outcome after primary treatment. However, toxicities of NSAIDs have limited their use as antineoplastic therapy. Recent data have suggested that the benefit of aspirin after CRC diagnosis is limited to patients with PIK3CA-mutant cancers. We sought to determine the predictive utility of PIK3CA mutation for benefit from both cyclooxygenase-2 inhibition and aspirin. METHODS: We performed molecular analysis of tumors from 896 participants in the Vioxx in Colorectal Cancer Therapy: Definition of Optimal Regime (VICTOR) trial, a large randomized trial comparing rofecoxib with placebo after primary CRC resection. We compared relapse-free survival and overall survival between rofecoxib therapy and placebo and between the use and nonuse of low-dose aspirin, according to tumor PIK3CA mutation status. RESULTS: We found no evidence of a greater benefit from rofecoxib treatment compared with placebo in patients whose tumors had PIK3CA mutations (multivariate adjusted hazard ratio [HR], 1.2; 95% CI, 0.53 to 2.72; P = .66; (P)INTERACTION = .47) compared with patients with PIK3CA wild-type cancers (HR, 0.87; 95% CI, 0.64 to 1.16; P = .34). In contrast, regular aspirin use after CRC diagnosis was associated with a reduced rate of CRC recurrence in patients with PIK3CA-mutant cancers (HR, 0.11; 95% CI, 0.001 to 0.832; P = .027; (P)INTERACTION = .024) but not in patients lacking tumor PIK3CA mutation (HR, 0.92; 95% CI, 0.60 to 1.42; P = .71). CONCLUSION: Although tumor PIK3CA mutation does not predict benefit from rofecoxib treatment, it merits further evaluation as a predictive biomarker for aspirin therapy. Our findings are concordant with recent data and support the prospective investigation of adjuvant aspirin in PIK3CA-mutant CRC. Accurate duplication of DNA prior to cell division is essential to suppress mutagenesis and tumour development. The high fidelity of eukaryotic DNA replication is due to a combination of accurate incorporation of nucleotides into the nascent DNA strand by DNA polymerases, the recognition and removal of mispaired nucleotides (proofreading) by the exonuclease activity of DNA polymerases δ and ε, and post-replication surveillance and repair of newly synthesized DNA by the mismatch repair (MMR) apparatus. While the contribution of defective MMR to neoplasia is well recognized, evidence that faulty DNA polymerase activity is important in cancer development has been limited. We have recently shown that germline POLE and POLD1 exonuclease domain mutations (EDMs) predispose to colorectal cancer (CRC) and, in the latter case, to endometrial cancer (EC). Somatic POLE mutations also occur in 5-10% of sporadic CRCs and underlie a hypermutator, microsatellite-stable molecular phenotype. We hypothesized that sporadic ECs might also acquire somatic POLE and/or POLD1 mutations. Here, we have found that missense POLE EDMs with good evidence of pathogenic effects are present in 7% of a set of 173 endometrial cancers, although POLD1 EDMs are uncommon. The POLE mutations localized to highly conserved residues and were strongly predicted to affect proofreading. Consistent with this, POLE-mutant tumours were hypermutated, with a high frequency of base substitutions, and an especially large relative excess of G:C>T:A transversions. All POLE EDM tumours were microsatellite stable, suggesting that defects in either DNA proofreading or MMR provide alternative mechanisms to achieve genomic instability and tumourigenesis. Colorectal cancer (CRC) is the third commonest cancer in the Western world. Approximately one-quarter of cases are classified as Stage II/Dukes' B, meaning that the disease has breached the bowel wall but not spread to draining lymph nodes or distant sites. Stage II colon cancer is a heterogeneous disease both biologically and in terms of outcome. Although pivotal data have confirmed the benefit of adjuvant 5-fluorouracil (FU) chemotherapy following resection of stage II tumours the absolute reduction in risk of recurrence is small - 3 to 4 percentage points - and so most patients treated fail to gain from therapy. In contrast to stage III disease, the addition of oxaliplatin to FU as adjuvant chemotherapy for stage II disease does not improve outcome. Much attention has focused on the identification of biomarkers that identify patients more or less likely to benefit from treatment. Recent data confirm that patients with T3 primary and tumour microsatellite instability (MSI) have excellent prognosis and do not require adjuvant chemotherapy. For patients with microsatellite-stable disease, a validated recurrence score based on gene expression provides greater prognostic information than conventional clinicopathological features alone and can be used to inform discussion on the benefits of adjuvant chemotherapy. BACKGROUND/AIMS: During the last two decades, hundreds of reports have detailed putative prognostic and predictive biomarkers for colorectal cancer (CRC). However, the majority of these studies have been small and retrospective, reporting results that are highly likely to represent false positives. Consequently, their relevance to clinical practice requires definition. METHODS: Review of published literature on CRC biomarkers, focusing on early-stage disease. RESULTS: Although most putative biomarkers have failed to be validated in subsequent studies, level I evidence now indicates that tumour microsatellite instability can be used to identify a cohort of patients with stage IIA disease at low risk of relapse who can be spared adjuvant chemotherapy. Emerging data suggest that gene expression arrays may have a role in selecting patients with stage IIA disease and mismatch repair-proficient tumours for chemotherapy following tumour resection. CONCLUSION: Despite the profusion of biomarker literature, only mismatch repair status can be recommended as routine in current clinical practice. High-quality, adequately powered studies are essential to accurately define the utility of existing and putative biomarkers, and to support their rational application in the clinic. The tumour suppressor PTEN is a key negative regulator of the PI3K-Akt pathway, and is frequently either reduced or lost in human tumours. Murine genetic studies have confirmed that reduction of Pten promotes tumourigenesis in multiple organs, and demonstrated dependency of tumour development on the activation of downstream components such as Akt. Insulin-like growth factors (IGFs) act via IGF1R to activate the PI3K-Akt pathway, and are commonly upregulated in cancer. A context-dependent interplay between IGFs and PTEN exists in normal tissue and tumours; increased IGF2 ligand supply induces Pten expression creating an autoregulatory negative feedback loop, whereas complete loss of PTEN may either cooperate with IGF overexpression in tumour promotion, or result in desensitisation to IGF ligand. However, it remains unknown whether neoplasia associated with Pten loss is dependent on upstream IGF ligand supply in vivo. We evaluated this by generation of Pten(+/-) mice with differing allelic dosage of Igf2, an imprinted gene encoding the potent embryonic and tumour growth factor Igf2. We show that biallelic Igf2 supply potentiates a previously unreported Pten(+/-) placental phenotype and results in strain-dependent cardiac hyperplasia and neonatal lethality. Importantly, we also show that the effects of Pten loss in vivo are modified by Igf2 supply, as lack of Igf2 results in extended survival and delayed tumour development while biallelic supply is associated with reduced lifespan and accelerated neoplasia in females. Furthermore, we demonstrate that reduction of PTEN protein to heterozygote levels in human MCF7 cells is associated with increased proliferation in response to IGF2, and does not result in desensitisation to IGF2 signalling. These data indicate that the effects of Pten loss at heterozygote levels commonly observed in human tumours are modified by Igf2 ligand, and emphasise the importance of the evaluation of upstream pathways in tumours with Pten loss. Survivin is a 16.5 kDa protein that functions to inhibit apoptosis, promote proliferation, and enhance invasion. Absent in most adult tissues, survivin is selectively upregulated in many human tumors, where its overexpression correlates with poor outcome and treatment resistance. Consequently, survivin is a promising target for cancer therapy. Preclinical data demonstrate that survivin inhibition reduces cell proliferation, increases apoptosis, and sensitises cells to cytotoxic agents and radiotherapy. The pharmacological survivin inhibitors LY2181308 and YM155 have demonstrated acceptable toxicity and evidence of therapeutic efficacy as single agents in early-phase clinical trials. Current efforts seek to define the optimum use of survivin inhibitors in combination with cytotoxic therapies, where it is hoped that preclinical evidence of treatment synergy will translate into improved therapeutic efficacy. Results from these ongoing studies are keenly awaited. PURPOSE OF REVIEW: The past couple of years have seen a flurry of publications detailing potential prognostic and predictive biomarkers for colorectal cancer. However, most studies have been underpowered and demonstrate elements of a statistical 'fishing exercise', that is the carrying out of a huge number of analyses to find a hint of importance for a particular marker. RECENT FINDINGS: Recently some well powered analyses using separate development and validation datasets and multivariate statistics have been published and these are starting to change attitudes towards such markers. SUMMARY: Although there are very limited markers in standard clinical practice, we feel that there are now some that are ready to be translated into routine use or that at least deserve some further attention and 'service assessment'. Murphy F, Church DN, Medley L, Davies JM, Breen D, Clelland C, Mackintosh D, Mugalaasi H, Butler R, Talbot DC. 2011. PHASE II TRIAL OF ERLOTINIB AS FIRST-LINE THERAPY IN NON-SMALL CELL LUNG CANCER OVER-EXPRESSING EGFR	JOURNAL OF THORACIC ONCOLOGY,	6	(6),	pp. S1250-S1250. OBJECTIVES: Brain metastases (BM) are a significant complication of metastatic breast cancer (MBC). The high incidence of BM in HER2 overexpressing MBC is now well recognized, however, the optimal management of such patients is not yet clearly defined. We aimed to analyze factors affecting survival after diagnosis of BM in patients treated in our center. MATERIALS AND METHODS: Retrospective analysis of survival in all patients treated with antineoplastic therapy for BM from MBC in our institution between May 1st 2002 and April 30th 2005, according to HER2 expression and use of trastuzumab after diagnosis of BM. RESULTS: The median survival of the 26 patients with HER2 overexpressing disease after diagnosis of BM was significantly longer than that of the 60 patients with HER2 nonoverexpressing disease (6.2 vs. 3.8 months, P = 0.027). Further analysis revealed that this seems to be due to the favorable outcome of the 70% (n = 18) of HER2 overexpressing patients who received trastuzumab after BM were diagnosed. Median survival of this group was 11.9 months, compared with 3.8 months (HER2 nonoverexpressing disease, P = 0.002) and 3.0 months (HER2 overexpressing disease not treated with trastuzumab after development of BM, P = 0.05). CONCLUSION: Patients with HER2 overexpressing MBC who received trastuzumab after diagnosis of BM survived longer than expected. This finding justifies an active therapeutic approach: disease progression within central nervous system does not preclude benefit from trastuzumab treatment. Purpose. Ifosfamide is a drug commonly used in the management of sarcomas and other solid tumours. One potential toxicity of its use is renal tubular damage, which can lead to skeletal abnormalities; rickets in children and osteomalacia in adults. We aimed to characterise this rare complication in adults. Patients. Three illustrative patient cases treated in our institution are presented. All were treated for sarcoma, and received varying doses of ifosfamide during their therapy. Methods. We performed a review of the literature on the renal tubular and skeletal complications of ifosfamide in adults. Papers were identified by searches of PubMed using the terms "osteomalacia," "nephrotoxicity," "Fanconi syndrome," "ifosfamide," and "chemotherapy" for articles published between 1970 and 2006. Additional papers were identified from review of references of relevant articles. Results. There are only four case reports of skeletal toxicity secondary to ifosfamide in adults; the majority of data refer to children. Risk factors for development of renal tubular dysfunction and osteodystrophy include platinum chemotherapy, increasing cumulative ifosfamide dose, and reduced nephron mass. The natural history of ifosfamide-induced renal damage is variable, dysfunction may not become apparent until some months after treatment, and may improve or worsen with time. Discussion. Ifosfamide-induced osteomalacia is seldom described in adults. Clinicians should be vigilant for its development, as timely intervention may minimise complications. OBJECTIVES: To review the published literature on the diagnosis and management of small cell carcinoma of the bladder (SCCB). METHODS: Papers were identified by searches of PubMed using the terms "small cell", "bladder" and "carcinoma". Additional papers were identified from review of references of relevant articles. RESULTS: SCCB comprises less than 1% of bladder malignancies. It is an aggressive tumour that commonly presents at an advanced stage, in an elderly population. Consequently, patients are often not fit for anti-neoplastic therapy. In fit patients, the bedrock of treatment in the majority of cases is platinum-based systemic chemotherapy, which was the only factor predictive of improved outcome on multivariate analysis in one large review. The use of neoadjuvant chemotherapy has been associated with favourable results and may therefore be the preferred approach when scheduling treatment. Options for local management comprise surgery or radiotherapy (sequentially or concurrently with chemotherapy), both of which are potentially curative in selected cases. However, the subsequent frequent development of urothelial malignancies with bladder-sparing approaches should be considered when planning treatment, particularly in younger patients. Prognosis of SCCB overall is poor, the median survival of all cases varies from 4 to 23 months, and overall survival at 5 years from 10% to 40% of patients. CONCLUSIONS: SCCB is a rare and aggressive tumour with a poor prognosis. Future efforts should be directed at its early detection and the development of more effective systemic therapies. BACKGROUND: Desmoplastic small round cell tumour (DSRCT) is a rare sarcoma primarily affecting young men. We report two cases in young women mimicking gynaecological malignancy. CASES: A 23-year-old woman underwent caesarean section for obstructed labour. At surgery, multiple tumour deposits were found throughout abdomen and pelvis. Histology and PCR confirmed DSRCT. Despite chemotherapy, the patient relapsed and died 27 months after diagnosis. A 29-year-old woman presented with abdominal distension and elevated Ca125. Imaging demonstrated widespread tumour within abdomen and pelvis. Histology confirmed DSRCT. Although attaining a complete response to chemotherapy, she relapsed within 2 months and died 11 months after diagnosis. CONCLUSION: DSRCT should be considered in the differential diagnosis of young women presenting with abdominal distension and multiple masses on imaging. Brain metastases from metastatic breast cancer typically occur in 10-15% of patients and are associated with survival of 3-6 months. Recent series have shown that women with HER2-positive metastatic breast cancer receiving the drug trastuzumab develop brain metastases more frequently than this, but also that continuation of trastuzumab after diagnosis of brain metastases in such patients is associated with extended survival. Authors have speculated that this is due to improved systemic control of disease; however, a possibility is that trastuzumab may have a beneficial effect on cerebral metastases themselves. We report the case of a woman with HER2-positive metastatic breast cancer who developed multiple brain metastases while on trastuzumab, in whom the addition of systemic chemotherapy to continued trastuzumab has produced multiple treatment responses associated with prolonged survival. This is the first report of its kind.